I know our minds are drifting towards Christmas. We’re already unpacking the ornaments, garland and lights in our minds, if we haven’t already begun in our homes. Maybe you are hosting Thanksgiving dinner so you are putting off the Christmas decorating until the last car pulls out of the driveway. You possibly have those lights already strung up but out of respect for the turkey, will wait until the sun sets on the 22nd to light em up. 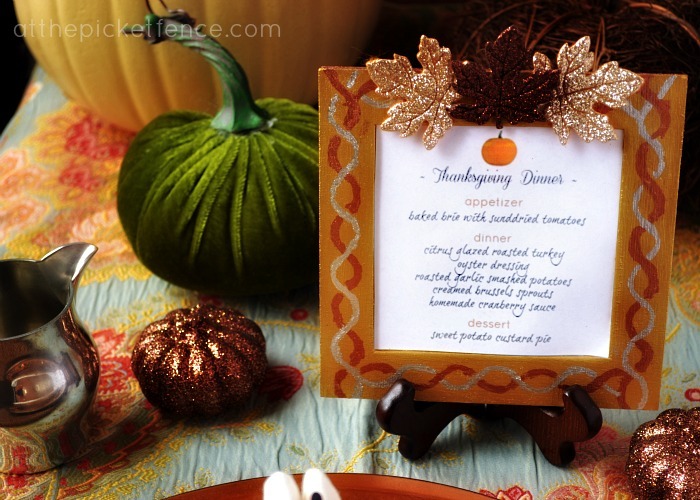 Glitzy Thanksgiving Place Setting Menus and Chalkboard Leaf Name Cards. 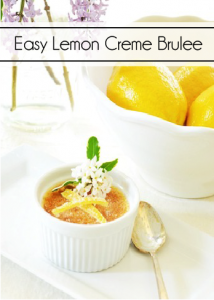 They are a great way to make each guest feel special and something you can even have the kids work on. 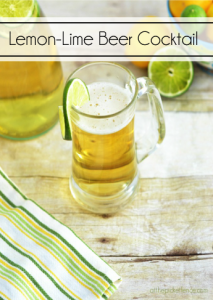 They can be as elaborate or as simple as you want them to be and with a customized menu inserted, your guests can get a sneak peek at the lovely meal you have prepared for them. I recently discovered Krylon Leafing Pens, which are the perfect way to add a touch of glitz to these projects! I love the chiseled tip which draws both thick and thin lines, which means you can paint with them and write with them! 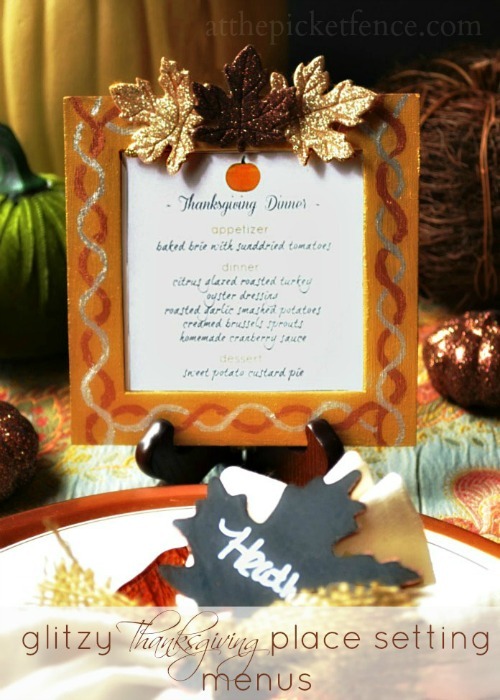 I love the metallic sheen on the menu frames, that just shouts “holiday.” What’s so great about the menu frames, is that the leaves can be replaced and you can create new inserts for your Christmas dinner or New Years Eve party! I thought the perfect accompaniment to my place setting menus, were Chalkboard Name Cards. Like stuffing to turkey, marshmallows to sweet potatoes, butter to rolls, these little leaf name cards go perfect with the glitzy menus. 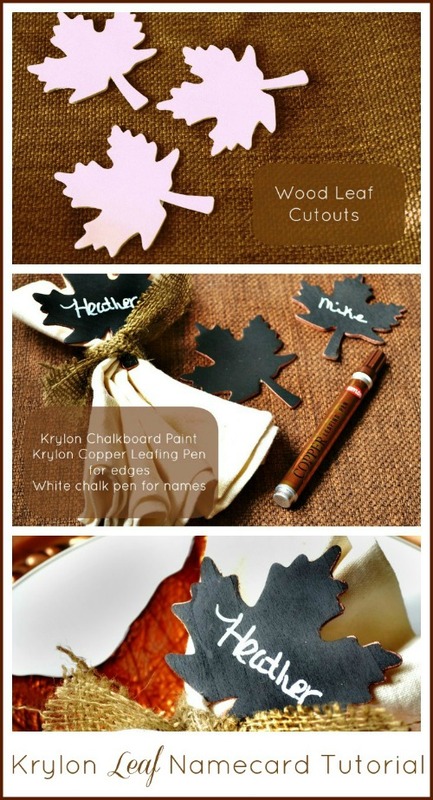 Again, these Chalkboard Leaf Name Cards couldn’t be easier to make! Using Krylon Chalkboard Paint in spray form or brush on you can use these again and again, or send them home with your guest as a fun keepsake. 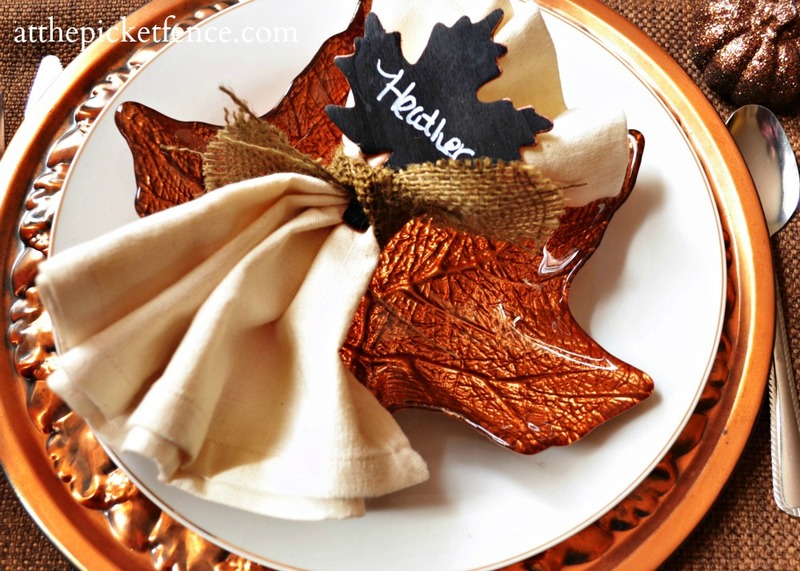 I love these quick and easy Thanksgiving Projects! Krylon always makes decorating for the holidays super easy and just a little glitzy with the fabulous metallic paint products….and let’s face it, who doesn’t love a little glitz and glamour! 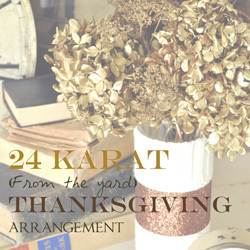 Are you looking for some more fabulous last minute Thanksgiving Projects? 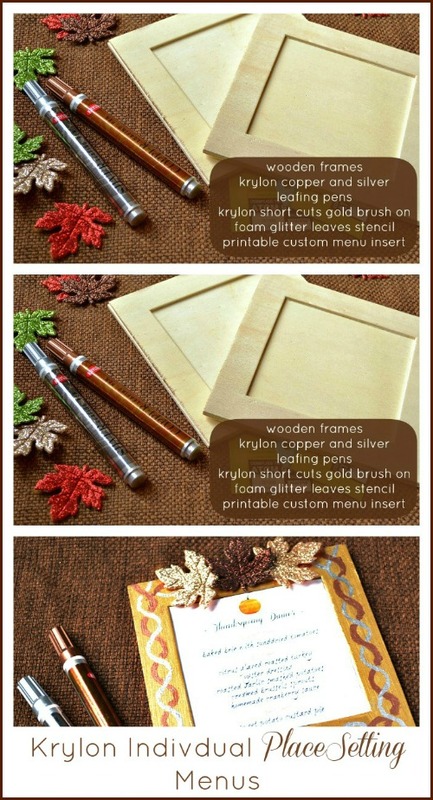 Visit Jenn from Jennifer Rizzo, Beth from Unskinny Boppy and Kelly from Eclectically Vintage , three talented bloggers, for these other amazing Thanksgiving projects made with Krylon! We’d love you to visit the Krylon Holiday Pinterest Board full of great ideas to last the whole holiday season! You can also get some amazing ideas by visiting Krylon’s Projects In A Can site full of projects as well as Make it Gr8 in 8, where you can share your quick 8 minute fixes using Krylon and enter to win some great prizes! Wishing you and yours a peaceful and lovely week with friends and family! Let’s remember ALL that we have to be thankful for….thanks for joining me at the picket fence. Krylon provided me product and compensation for this post, but not the turkey or stuffing, all opinions are my own. Please see our disclosure policy for more information. 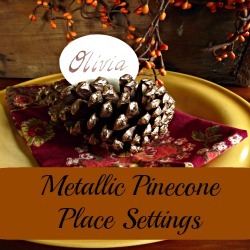 26 Comments on "Glitzy Thanksgiving Place Setting Menus…a fun last minute craft!" Thank you Linda, Happy Thanksgiving to you and yours! Heather that’s such a cute project. What a nice touch and great project for the kids (or adults). I hope you and your family have a wonderful Thanksgiving. Thank you sweet Judy! And a very happy Thanksgiving to you and yours as well! Heather – these are so unique! What a fun way to show off your fabulous menu – I love brussels sprouts (what time should I be there)!! Those metallic leafing pens are amazing – I am actually running off to Vegas with mine! We love us some brussels sprouts in this family. I might just run off to Vegas with mine too. 😉 Love them! Thank you Ann…and so very, very grateful for you! Happy Thanksgiving sweet friend. Sweet Sheila, every time you stop by it’s a ray of sunshine. 🙂 Have a lovely Thanksgiving! Such super cute projects! I am going to have to get some of those pens! Thank you my dear friend. I count YOU as one of the top blessings in my life! Happy Thanksgiving to you and yours! Thanks so much for sharing! I love the place setting menus! Have a Happy Thanksgiving! What a great idea! I would never have thought to put a little mini-menu at each place setting, like they do when you go to a fancy dinner, but why not? It’s Thanksgiving after all! Have a great one! I love this idea, so great! I love the leaves that is one of my favorites. Have Happy Thanksgiving! Just love both the menu “board” and the chalkboard tags….So creative…:) I must break down and buy those chalkboard pens…Your table setting is beautiful and “fun”…which makes for a fantastic combination!! Have a wonderful, wonderful Thanksgiving with your families!!! Happy Thanksgiving to you both!! Lovely ideas. This looks great. Happy Thanksgiving to you and your loved ones! I would love for you to visit me and see the centerpiece at my Thanksgiving table I am visiting you from Savvy Southern Style! Such wonderful projects. I can see myself giving them a try. Happy Thanksgiving! Ann-Marie! So wonderful to see you! thank you so much for stopping by, it’s so good to “see” you! Happy Thanksgiving to you! Very cute! You just reminded me that I have a bunch of little wooden leaves in the craft room that I had forgotten about. Too late now! Ha! Love this project- so sweet and love metallic!!! Wishing you girls a Happy Thanksgiving!!! 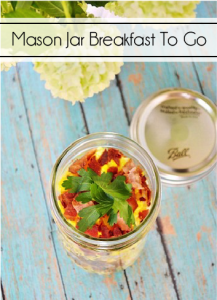 Super Like this project…so simple and easy to make…cannot wait to have a try on this. Absolutely adorable, Heather! It’s so sweet, fun and just plain cute!